[cleverdevil] Not sure if anyone has shared it before. [cleverdevil] May be a nice start on a mass migration tool. snarfed such a nerd snipe. "these x things are different. but they should be the same! they must be standardized!" 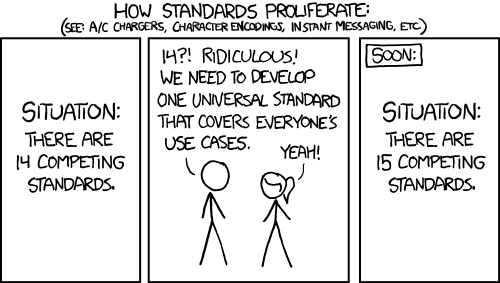 [cleverdevil] I'm surprised Loqi hasn't pulled in the canonical XKCD on the subject yet! [cleverdevil] Who knows how projects pick up stars these days. jacky lol just had a moment of "breakthrough"
jacky I don't see the overloading of it? KartikPrabhu i.e. you are using webmention for syndication and not to "notify the webpage that you linked to it"
jacky what would you propose to do adhoc syndication in an automated fashion? GWG snarfed: Syndication Links plugin. GWG jacky: Isn't it in the Location header? GWG Works for me right now. aaronpk Nice! I have Bridgy publish triggered by micropub syndicate-to also! aaronpk Hahahaha "I accept contributions in babysitting as well as PR"
[eddie] Does your class use Micropub or Webmention to do its syndication? [grantcodes] It could send webmentions though. [eddie] Is each syndication a subclass or do you pass the syndication target as a parameter? [grantcodes] Each syndication method has a unique id (I just use "Twitter", "Instagram" etc) and a "default" option. If default is true it will run that syndication if there is no syndicate-to set. Otherwise it will look for the id in "syndicate-to"
[asuh] [grantcodes] have you formally written about your setup? [asuh] it looks great, lots of work you put into it! jeremycherfas !tell aaronpk I believe there is still a lack of connection between Slack and IRC. jeremycherfas Oh, I'm sorry. #knownchat. jeremycherfas Should I add that to the message, or can you fix it zegnat? jeremycherfas You know about Fort Roberts, WA? sknebel [jgmac1106]: probably because the markup on the source page isn't great, and known doesn't make special rules for wordpress-weirdness? [jgmac1106] so it only looks like it work but didn't work? [jgmac1106] but if I can't have student A write a post on their wordpress.com and have it show up on student B's wordpress.com as a comment it is all for nothing....oh well....It's too late to say you need to spend $50, register a domain, figure out what this ftp thing, go to github , download known, now figure out how to use ftp and install the site, now set database..or go back to WordPress.org...still to late for the "spend $50, register a domain"
sknebel are you limited to some themes that WP.com offers? [jgmac1106] so basically try all their free themes and see if anyone gets closer to proper mark up? GWG Zegnat: I got _s, which is a starter theme many themes use as a framework to start theirs to fix it. [jgmac1106] you can't make it up: Unable to activate theme. Contact support. Zegnat sknebel did you find an hfeed in rebalance? I thought it was without? Zegnat [jgmac1106]: I was wondering if all the themes in the Automattic/themes repo were WP.com themes. In that case you can always try sending a PR. Removing (faulty) mf1 probably has a better chance than adding mf2 to go through. [jgmac1106] I get an error trying to install everyone of those noted themes. Maybe can't change theme on free account? [jgmac1106] ... My email.... Let me verify and try. Thx! jeremycherfas !tell [kevinmarks] Could you (or someone else?) possibly help me understand you sparkline script at http://www.kevinmarks.com/svgsparklines.html. I'm not sure where I should be storing my version of your `sparkline.svg` and I don't want to just use yours. jeremycherfas So you don't mind me putting you script and using my data? jeremycherfas If I want to adapt things like the size of viewbox or the thickness of the line, wouldn't that be easier if it were on my site? jeremycherfas OK. Then my next hurdle is to get Grav to load it, but I think I know how to do that. We shall see. jeremycherfas Jacky Kevin's script works fine for my data on my site, when I use his script to draw the sparkline. But when I try to put the script in my webspace, the call currently does not seem to find it. Wrestling with that. jeremycherfas Well, I am completely befuddled, and may well bore people about it on vHWC, especially if [Rose] is there. But for now I am happy. [Rose] I will be very croaky. My voice is gone, but hopefully I'll be present. jeremycherfas And if you're in the Grav discord you can see now what is vexing me. jeremycherfas Yes. I don't like it much. [jgmac1106] Sweet even if WP.com can't process the webmention the target still gets a pingback they can display... In other words works enough. [schmarty] Hopefully I am not opening a can of worms here but what about checking an h-feed for a single child h-entry? [schmarty] Haha first worm. Those posts should have u-url that won't match the url of the tag page, right? But I bet WP backcompat parsed stuff is missing that kind of info. [schmarty] I like this idea of testing popular free WP.com themes. That could probably be automated! [schmarty] sknebel: good point. If an oft-used rel like bookmark matches, then diving into the h-feed with a single child is more likely the content a user expects a parser to find. [kevinmarks] where did you put it, [jeremycherfas]? [jgmac1106] I have a problem. I have numerous sites I want to use webmention.io with but GitHub only allows me one url... I swap them in and out to register but how do people handle authentication and multiple domains? snarfed maybe wm.io feature request to pull web site urls from bio/description fields as well as web site field, like bridgy? [jgmac1106] Really? Only recognizes link in my url [eddie] not bio? How do you do it? [eddie] What is your current webmention.io url? [jgmac1106] Ohhhh I have been setting up a new endpoint for every new site..
snarfed we already have a few of those, right? [eddie] !tell aaronpk Looking at /p3k I noticed your posts published date is the top level property rather than inside the properties object, was there a specific reason for that other than the fact that properties is one of the values stored in the database? Loqi aaronpk: [eddie] left you a message 1 minute ago: Looking at /p3k I noticed your posts published date is the top level property rather than inside the properties object, was there a specific reason for that other than the fact that properties is one of the values stored in the database? Loqi aaronpk: jeremycherfas left you a message 12 hours, 11 minutes ago: I believe there is still a lack of connection between Slack and IRC.